Hello, I’m Fran! Welcome to The Happi Empire. I am an illustrator, graphics and website designer, based in Cornwall, UK. I am passionate about spiritual enlightenment and design. I’ve been building websites and designing graphics for over 15 years – I built my first website when I was 15. I’m self-taught and particularly love illustration. Although I’ve been doing this for so long, it wasn’t until 2011 that I finally found the courage to start my full time business, offering website & graphic design to heart-centred businesses. You can learn more about my design services here: www.happifran.com. The Happi Empire came about after I left school. I was fed up with academic learning and didn’t have many inspiring options for what to do next. My brother had just come back from a metaphysics retreat a changed man, which impressed Mum & I so much that we decided to go and do it too. The things I learned on that retreat gave me a complete perspective shift and an urge to share what I learned. I realised the importance of creating my life and business as a way to immerse myself in these philosophies, so I wouldn’t forget (one of the egos fave ways to keep you stuck!). In 2004, I created my first product, Happi Cards, to act as reminders of everything I learned on the retreat. Since then, Happi Cards have gone through 4 redesigns and improvements. Happi Cards today, are reminders about simple, universal truths. They have found their way into over 5,000 people’s homes since then (& hopefully their hearts too!). Happi Cards shift your perspective and keep you on track with who you really are. At the beginning, selling Happi Cards was a very part-time hobby. I attended a lot of personal & spiritual development workshops & classes, and got a bit lost in the distractions of life. A few years later, after some fun and pain c/o The University Of Life (so cheesy!) I launched The Happi Empire in 2011. The name ‘The Happi Empire’ was derived from Happi Cards. The ‘i’ symbolising inner happiness, rather than seeking for it outside of ourselves. I designed the original Gratitude journal (which has since had a redesign) and the following year a range of mini action pads and the Self Care Playbook. During this time, I also created greetings cards, A3 and A4 inspiring prints and the old favourite Happi Licence! The Playsheets are a great way to keep tabs on your self-love maintenance. The Gratitude Journal meets you wherever you are and helps you to reach for thoughts to bring in more joy. And my mini meditations are useful for bringing yourself back to centre. The initial metaphysics retreats I attended were run by a deep trance channel, Margaret McElroy, who channeled Maitreya. After that I studied Abraham Hicks, Colin Tipping, Louise Hay, Eckhart Tolle, Belinda Davidson, astrology, Reiki, energy, meditation and yoga. 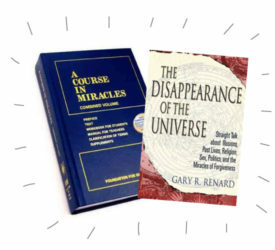 I had also dipped my toe in and out of A Course In Miracles, with the help of Gary Renard’s workshops & books. After all these years of study, I have reached a point where I don’t feel the need to search any more. I’m still very much a student, but for me, A Course In Miracles has all the answers. It is a book which includes a text, workbook & manual for teachers. It teaches about oneness & undoing the ego. It’s written to be a self study course, so it will never turn into a religion or hierarchy. It is purely a mind-training course to undo the ego & return to the experience of oneness & love. I send out monthly inspiration, love, product news & freebies.